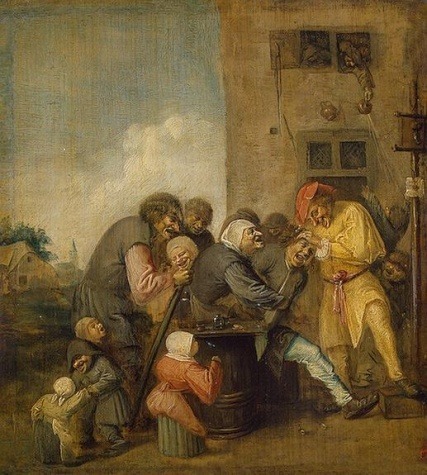 The Back Operation is one of Adriaen Brouwer's many surgical works showing an operation being performed on a member of lower class by an unfit doctor. Some people even acted as doctors and had no medical training, such as local barbers who were used for their skill with a blade. 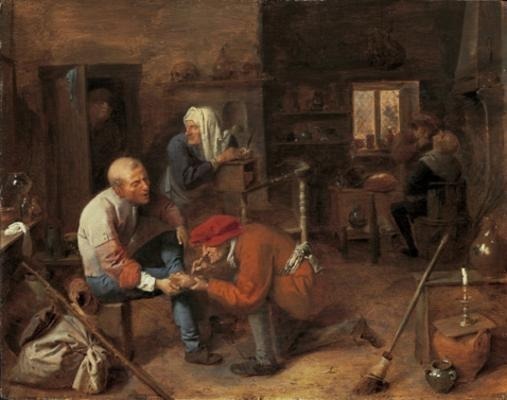 Brouwer befriended many peasants and spent a great deal of time in local taverns and streets and its likely to have been the reason why he produced several works on this theme, showing how 'surgery' was carried out on the poor who could not afford a qualified doctor. These operations probably took place in the back room of a tavern or inn. In The Back Operation the viewer sees a young man wincing in pain as the surgeon opens the flesh on his back to remove what can be assumed to have been a skin infection or a boil. Skin infections were common in the past especially during this period because of a lack of hygiene and were commonly found on the back where it was exposed to regular friction, sweat and irritation. It's likely that the man being operated on had a few rounds of ale to numb his pain. The 'operating theatre' contains the most basic of tools that were used in everyday life. 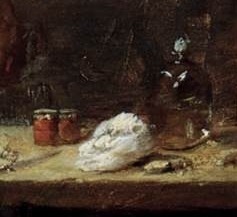 On the table are a few cotton wheels available for stitching the wound, some alcohol for disinfectant, a thin slicing knife and a magnifying glass held by the woman or 'nurse'. Depictions such as this were fairly common in the Netherland and other artists who created work on this theme include Bosch and Brueghel. The Back Operation is situated on three planes formed on top of each other. The depth of the work is defined by the positioning of the characters in the scene. Brouwer also accentuated space and dimension by the shadow contrasts he created and the light sources which he painted in the dim lit room. Depth created by the positioned bodies and the 'nurse' is painted the farthest in the image and her right side is darkened in the shadows. The light source is most definitely coming from behind the doctor as it shines in full force on the patient's back. All objects and features before the patient and doctor are in shadow. The eye is first drawn to the cringing patient whose body flexes to the right and the brightened objects on the table become apparent. The gaze then turns to the nurse whose body bends towards the fake doctor who leads us back to the patient, the focus of this work. 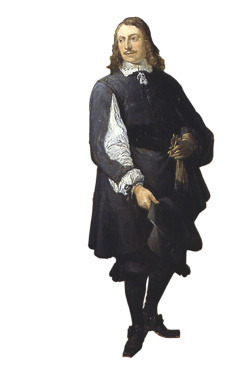 The color palette used for this work is similar to that of Hals. Brouwer's subjects are large and dominant in this scene and his bold colors with various over layers are also characteristic of Hals's paintings. The colors evident in this piece are browns, white, greys, yellows, reds mixed with white and various oranges and some pinks. 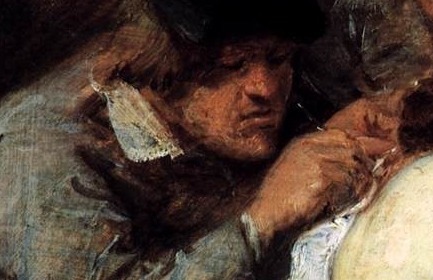 The artist's flesh tones vary as he uses several tones to accentuate the main subject matter in comparison to the burnished tones used for the doctor and nurse. 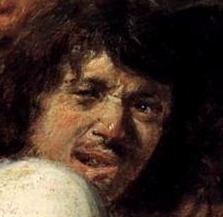 Brouwer painted the patient's skin in bright white tones to reinforce his central status and by doing so the viewer is aware of the patient's pain and emotion. The doctor and nurse are painted using strong orange and slight red tones to show their flushed skin in the warm room. The reds can also be seen on the patient's face and he is also flushed, more than likely due to alcohol consumption. 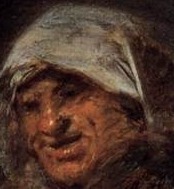 Brouwer uses dark and light browns to define facial muscles and expression. The artist's brush work here also takes after Hals' approach to creating movement and definition with thick, broad strokes upon the canvas. For his final layer Brouwer uses a medium to thin width paint brush and applied white paint as an over layer while the bottom layer was still wet so that the white tone can be seen blending in with the stronger tones. The end result is streaks of light and dark paints in one stroke. Brouwer has also used this technique with his light grey for the patient's shirt and the 'doctor's clothes. He can be seen using light brown and earthy greens in this manner for the background walls to help define the subject shape and presence. His brush strokes are long and rough for the people, and seen to be thinner and smoother for the furniture. 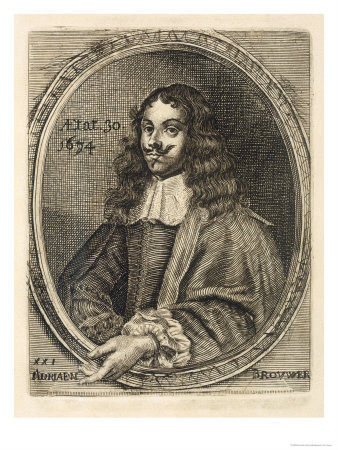 The ultimate 'bohemian artist' of the 17th century, the greatest admiration for Brouwer's work was in regards to his subject matter and landscapes. Most of the artist's admirers were close friends too and most sought to recreate the emotional and psychological rendering that he so successfully executed in his works. 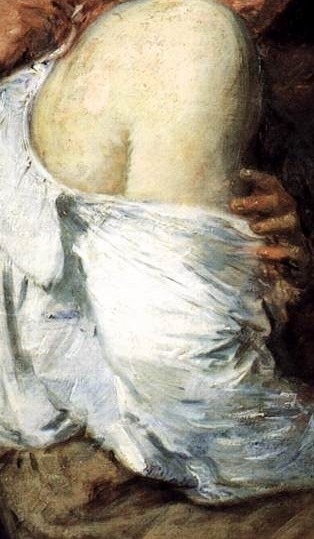 Although his depictions often included rather crude subject matter his figure paintings were noted for their precise color and refined execution. Brouwer was skilled at being able to immerse himself in his surroundings but extract himself when necessary to execute his works. He became an observer in local taverns and detached himself enough to create his vivid, realistic images. Such images could only have been produced by a sober man who was in complete control of his senses. It was Brouwer's verve and taste in composition that allowed him to stand out from his peers and influence masters such as Adriaen van Ostade, Jan Steen and David Teniers the Younger. Whether for his craftsmanship or concepts, Adriaen Brouwer is possibly the greatest painter of the lower classes that ever existed and today his works can be found in the best art museums around the world.